YSR is Yeduguri Samuel Rajasekhara Reddy - chief minister of the Indian state of Andhra Pradesh. Famous - sorry, infamous - for a lot of things. Read here. Right now, his prime focus is apparently trying to wrest control of one of Hinduism's most famous pilgrimage sites - Tirupati-Tirumala. Remember that the temple has an annual revenue of Rs. 7,380 million = 164 million$ ! The amount of religious conversion activity in T-T is unprecedented. Despite the government rule that this is not allowed there. 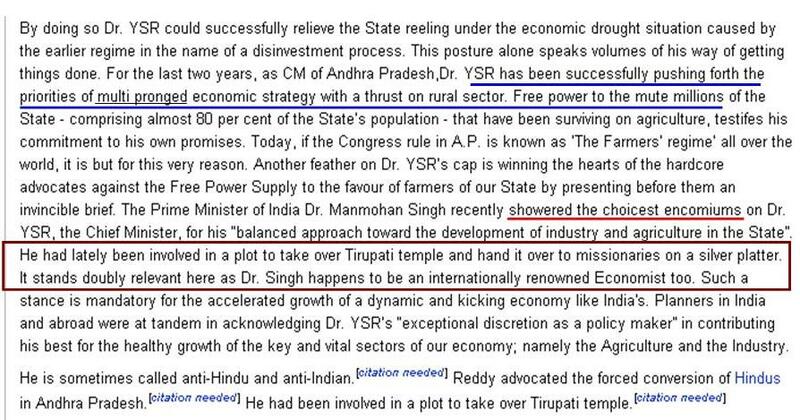 Forget that, YSR's government came up with a statement saying only two of the seven hills belong to the temple! Then after vociferous protests, they have now said 'it depends on the centre'. See here. Also remember that this is same guy who proposed a 5% reservation for Muslims - divisive politics. The religion quota was thankfully refused permission by the Supreme Court. See here. Recently, there was a meeting by Hindu religious leaders to discuss the tremendous conversion activity occuring in Tirupati-Tirumala. Needless to say, a fact-finding commission found out serious issues eg. employees of the temple board being converted - again not allowed as per law. This is the problem. Tolerance is taken for granted to conduct mischief. And it then turns a full circle. 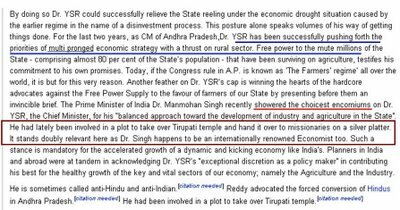 Apparently YSRs multipronged economic strategy is to give free power. Bombay Blasts : Leave the grieving alone!